Below is my current setup, 2 mistakes made on this setup which may be helpful to avoid. 1. I use 1 pump for all the grow bed. This arrangement if the pump fail then 4 bed will be at risk, if its clog then it will also be a problem. My pump clogged and the water inflow was drastically reduced, this cause oxygen level to drop and distress the fish. Now I am running a 20 watt venturi power head to provide emergency aeration. 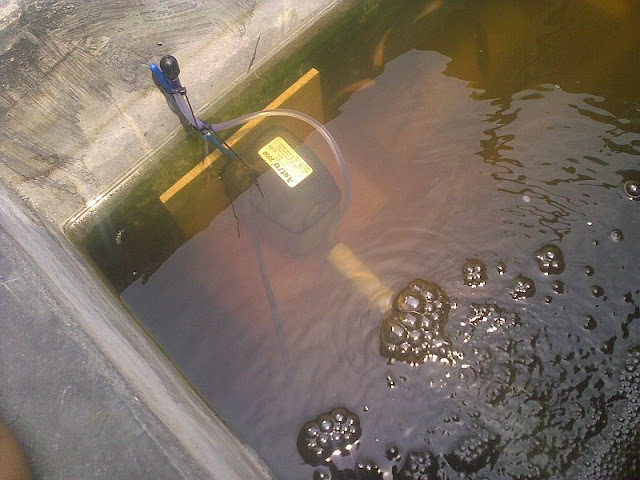 This pump work so well in aerating the tank I may put it permanently for this purpose. 2. My 2nd mistakes was to locate the pump in a difficult location to get at. No matter how good is the pump it will one day fail or it may get clogged. I've learn my lesson and now relocate the pump to a more convenient location to get at. It need to be clean periodically. I hope to make minor changes to the setup, for one I'll reuse those individual pump and have them accessible easily.